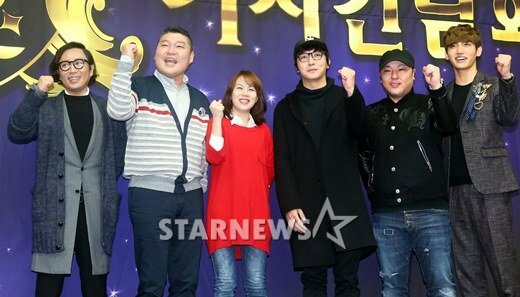 The cast of ‘Moonlight Prince’ put aside their sorrow and ended their last filming schedule with humor. The last filming schedule of KBS 2TV’s ‘Moonlight Prince’ took place on the 6th at the KBS building in Yeoido. The day’s episode was centered around the relationship playbook for single women ‘Act Like a Lady, Think Like a Man’ (written by Steven Harvey) and 2AM’s Jin Woon and Changmin, and Kim Tae Woo appeared as the final guests of the show. The MCs of ‘Moonlight Prince’ (Kang Ho Dong, Tak Jae Hoon, Max Changmin, Brave Brothers, Jung Jae Hyung) began the episode with an introduction of the guest stars, who started off by talking about their recent activities and whereabouts. The MCs set aside their disappointed sorrow of having their show canceled and instead focused on doing their best till the very end. Instead of lingering on the fact that it was the last episode, the guests also actively participated in the ‘book talk’ format of the program. MCs Kang Ho Dong and Tak Jae Hoon touched upon their disappointment of having the show cancelled while talking with the guest stars. Kang Ho Dong said, “‘Moonlight Prince’ is on the rise these days. We’re seeing an upwards trend.” This referred to the fact that the show recorded viewer ratings of 4.8% (Nielsen Korea), which was a 1.7% increase from the previous episode. In response to the MCs’ comments about the end of the show, the guest stars said, “We’ve enjoyed watching the show,” and the MCs showed their gratitude for the guests for watching the program. Meanwhile, ‘Moonlight Prince’ first began airing on the 22nd of January. It will stop airing after its eighth episode on the 12th of March due to low viewer ratings. ‘Moonlight Prince’ is a ‘book talk’ variety show that chooses a book every week to act as a theme for the show’s talk segment. The MCs are Kang Ho Dong, Tak Jae Hoon, Max Changmin, Brave Brothers and Jung Jae Hyung.